Teams of Médecins Sans Frontières or Doctors Without Borders (MSF) have provided one million medical consultations to Rohingyas and the local community in across Cox’s Bazar between August 2017 and December 2018. MSF medical coordinator Jessica Patti said almost 9 percent (92,766) of their 1.05 million consultations were for acute watery diarrhoea, most of them children under five, who are particularly vulnerable to the condition, and who can die if it goes untreated. While severe cases need to be admitted to hospital, most people can go home after being properly rehydrated, said the MSF on Wednesday. Diarrhoea is related to the poor and overcrowded living conditions in the camps, MSF said adding that often Rohingyas live in small shelters built from bamboo and plastic sheeting and shared with many family members. Clean drinking water and well-maintained latrines are key factors in preventing diarrhoea, and health promotion activities focusing on improving hygiene are crucial. Today, accordingly to MSF, people in the camps are better protected from disease outbreaks, and their teams continue to do routine vaccinations, but the risk still exists. In recent weeks, for example, they have treated several hundred cases of chicken pox, a disease that can have complications for pregnant women, or when the person who catches it is also suffering from other diseases. Most of the Rohingyas, the MSF said, have experienced traumatic events and many have suffered or witnessed violence and lost close relatives and friends. As at the beginning of the emergency, though now for different reasons, the MSF said sexual violence remains an important focus. “A number of women arrive at our facilities with sexually transmitted infections that have gone untreated for a long time,” it said. 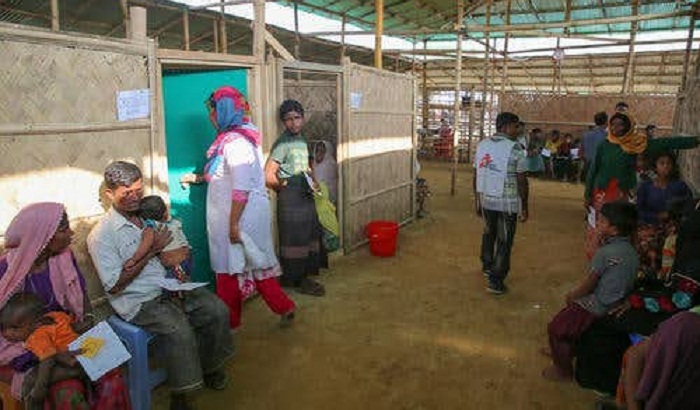 The MSF said their continued presence in Cox’s Bazar is also leading to an increase in consultations for members of the local Bangladeshi community, particularly in those health facilities that are not located in the middle of the camps.